Discussion in 'Muppet Headlines' started by Phillip, Mar 16, 2018. Today's the day! 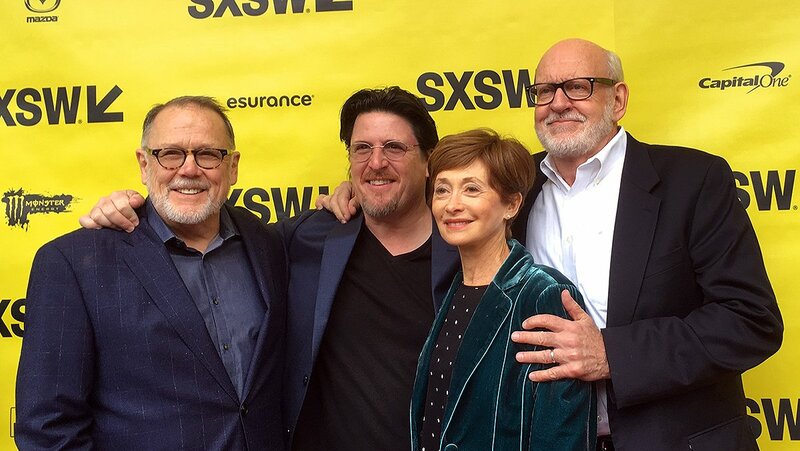 The Frank Oz directed and Victoria Labalme produced documentary, "Muppet Guys Talking: Secrets Behind the Show the Whole World Watched" premieres on-line at muppetguystalking.com beginning at 6 am central, 5 am eastern. 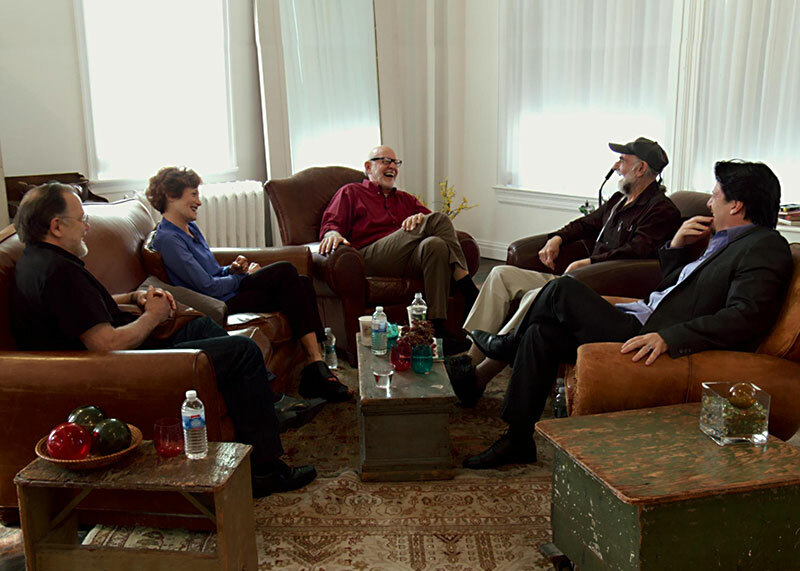 For the first time ever, five of the Muppet Performers (Jerry Nelson, Dave Goelz, Fran Brill, Bill Barretta, and Frank Oz) all got together on camera and talked about The Muppets. This behind-the-scenes documentary was filmed in an all-day shoot in 2012. We were privileged to see this amazing documentary last March at the world premiere at SXSW in Austin, Texas. After you see the film on-line, please post here and let us know your thoughts. If you've seen "Muppet Guys Talking", please like this post and share your thoughts below. Instantly stream/download the film. Secrets revealed, unexpected stories, behind the scenes footage, and a private glimpse into Jim Henson’s unique and visionary leadership. Get a personalized login and download or watch the documentary as often as you’d like. You get to be part of a online audience and watch/listen to the Guys during two LIVE unprecedented, unscripted video Hangouts. They’ll share never-before-heard anecdotes and answer select viewer questions. Participate in the Hangouts whether you can make it live or not. Submit your questions in advance, watch whenever you want, and relive the fun over and over again. Interact with the Muppet Guys Talking fans. Discuss the film, the Hangouts, the Guys or anything else! Deleted Scenes, Outtakes, AND other great moments we couldn’t fit into the movie. Nothing fancy schmancy. Just a simple white sleeve with the Muppet Guys Talking DVD inside, personally signed by Frank Oz to you. Limited edition. I was surprised by the prices mentioned here and the official World Wide Web site for the movie since the (official) electronic mail I had received regarding the movie over the past year had no mention of them or any plans to price it. This may sound stupid, but I thought it was in the website that it would be free. But oh well if it was on Amazon Prime or Netflix I was going to pay the money anyway. But I'll still pay for this incredible film. Purchasing the film is a great way to directly say "thanks" to the wonderful people who've given us all a lifetime of enjoyment. It's money well spent. aVeryBriefCameo and BlakeConor14 like this. I did not find any thing wrong regarding that "thought" of yours and would had not described it as "stupid" if I were you (I would had not used any negative language in reference to it at all). I was quite happy and willing to pay for the Below Stage Pass. This is gonna be fun! I just finished watching the documentary and my Frog am I just so emotional right now! Jerry had me crying, Frank and Dave had me giggling, Bill was just...well...Bill being all amazing and Fran won my heart all over again. Great stories, amazing memories and brilliant laughs! Guys, I'm officially back in the Muppet fandom if it means that these five are going to continue collaborating. This was the exact push I needed! aVeryBriefCameo, ConsummateVs, dwayne1115 and 4 others like this. I know it's money well spent, but I wasn't expecting the prices at all! Oh well, anyway, it's fine. They deserve to get some money off this anyway! I would had mentioned plans to price the movie several days or months in advance if I were one of its promoters (it would had been very helpful for certain folks who might had wanted to see it and/or hear it). Blue Frackle and BlakeConor14 like this. Any plans for a dvd or bluray??? I haven't purchased it yet. Anybody know if you have to use a credit card to purchase the download or if you can use a debit card or prepaid credit card? I don't mind paying, though I'd really rather pay if it was a DVD/Blu-ray, movie ticket, or iTunes download. Also, anyone know if you can just download the movie now and then download the bonus content later (taking off what is already paid for)? I think Toughpigs posted that it would be free but misunderstood and posted a correction. Frank Oz keeps saying that it won't be on DVD or Blu-ray and watching it from the site will be the only way to see it. I paid for the 9.97 download. I assumed there would be a fee as there is with most film downloads, but I can see where some could be caught off guard as the cost entered the discussion only a few days ago. That said I think it is a decent price and well worth the money. There are a few oft told tales, but there was also a lot of new (to me at least) stories and behind the scenes info. They include some fond remembrances of Richard Hunt, Don Sahlin, Jerry Juhl and of course Jim Henson. It's clear that this is a group of people with deep affection and respect for each other. I used a credit card to purchase. It didn't indicate they wouldn't accept debit cards, so minormuppets it might be worth giving it a try. Why would something like this be free in the first place?? Lol, content isn’t always free. I really wanna pay for the below stage pass, but I'm not sure I can afford it. I'll see if I can get the film later. I know; they really wouldn't have went on GMA to promote a free product. I really have to sit back for a minute and take in what I just saw and heard. For anyone who wants to become A puppeteer here is just about everything you need to know from five of the most talented and creative people you will ever see. Gosh, It's been about 4 hours since I watched this, and I honestly feel like in some way I just met Jim Henson himself. This ladies and gentlemen is the core of what the Muppets are about. Forget about Disney, forget about the 2011 movie, forget about Muppets Most Wanted, and forget about the last TV series, because Muppet Guy's Talking brings back the characters we've known and loved to who they really are. Wow I'm just really in awe of it all, I really can't explain how I feel because this has brought out so many different feelings and thoughts that it's really going to take another viewing or four to really be able to explain how I feel and think. All I can really say is if your a young Muppet fan watch this, If your an older Muppet fan watch this, if your an up and coming puppeteer watch this, because this will change your outloook. Grumpo, aVeryBriefCameo, Froggy Fool and 2 others like this. I saw a comment somewhere on Facebook that Steve Whitmire is not mentioned in the documentary, which if true is kinda sad. But considering they cut nine hours down to just 65 minutes, there's surely a lot of important stuff discussed that don't show up in the final cut (I guess we'll find out when the extra content is out). I also wonder if ommitting any mention of Steve Whitmire could have been due to the fact that he'd be mentioned as working with the Muppets in the present tense, when he's no longer involved. Does the documentary talk about Kevin Clash? Before anybody points out that Jerry Nelson appears despite having passed on since and Fran Brill is there despite being retired (but she's been active in the publcity), that's different. Besides, it'd be hard to cut them out. I saw at Muppet Wiki that the documentary is dedicated to Jerry Nelson. I had a feeling he'd get a dedication, though I also kinda imagined there'd be a long list of people to dedicate the film to. I kept imagining it might say something like "Dedicated to the memories of Jim Henson, Richard Hunt, Jerry Nelson, Jerry Juhl, Jane Henson, Don Shalin, Kermit Love, Jon Stone, Jeff Moss, Joe Raposo, Eren Ozker, Michael Earl Davis, John Henson..." and maybe some others (and a few of those names might be pushing it), to give in the spirit of all-inclusiveness (I also imagined a long list of dedications ending with "and Jerry Nelson and especially Jim Henson", kinda giving them the all-important "and" billings). I've seen people post on Tough Pigs that it's bad that they didn't mention the high price for the expanded package until it was out. It would have been nice if they'd said that sooner (maybe fans could have saved a bit), especially since that version appears to only be available for a limited time. Even though they don't necessarily say in loving memory of the long list of people in its own way it's a tribute to all those you mentioned and many more both living and dead. As for not mentioning Steve, I could only speculate, and that could be dangerous. As far as the pricing since day one I kept asking on their Facebook page about the issue, and I think from what I saw they did not know prices until late the last minute. I've seen people everywhere complain about having to pay , but honestly it's really worth every penny. Especially for young puppeteers because in my mind this video is about as good as any college course you could take on the art. PAY? FOR A MOVIE?! Well, I never! LittleJerry92, minor muppetz, ConsummateVs and 2 others like this.